The Pure Acoustic Active Transducer System is a landmark development in acoustic stringed instrument amplification and is the natural choice for the discerning acoustic musician. The Pure Acoustic Active Transducer System is a direct descendant of technology first pioneered over twenty years ago by Kenny Johnson in the original Skyinbow electric/acoustic violins. 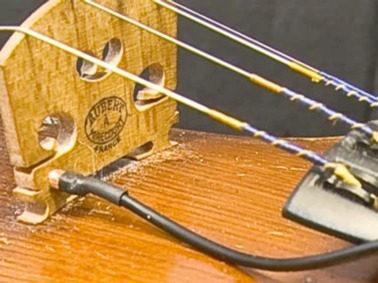 That acoustic pickup technology became part of the acclaimed Active Acoustic Modular Pickup system, which has been seen on stage and in studios worldwide fitted both to Skyinbow violins and to the instruments of professional and amateur musicians alike. Over the last few years every aspect of the AAMP system, from pickup element to preamplifier, has undergone intense research and development and field testing. The result of this enormous effort is the brand-new, Pure Acoustic Active Transducer System for acoustic string instruments. The Pure Acoustic ATS delivers a pure, unprocessed sound that we believe is more accurate, more dynamic, more natural and more life-like than other commercial pickup/preamplifier systems. 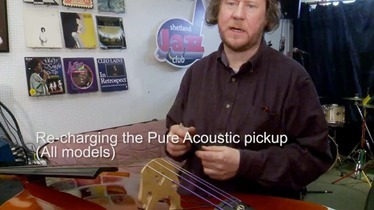 The Pure Acoustic ATS is characterised by the complete absence of piezo "quack", which has simply been designed out rather than being compensated for, and sounds more as though the instrument is being played through a microphone, rather than via a pickup. The heart of the system is the hand-built Pure Acoustic transducer, a small copper cylinder that can be fitted unobtrusively to virtually any acoustic stringed instrument. Complementing the new transducer is the all-new Pure Acoustic preamplifier, which was designed in conjunction with engineers who have decades of experience in high-end analogue audio electronics. This preamplifier has a 40Hz- 40kHz bandwidth, thus ensuring the greatest possible accuracy in reproduction. The Pure Acoustic preamplifier is powered by a rechargeable battery system* based on field-proven, computer industry technology. 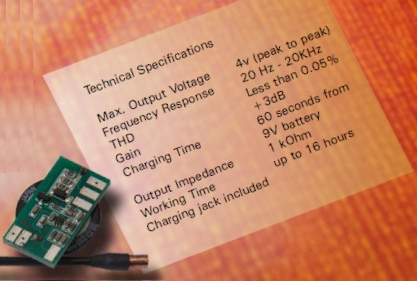 Charged from an external source (9v battery or power supply) the Pure Acoustic Preamplifier will run for a minimum of ten hours on one 60-second charge. Pure Acoustic Active Transducer Systems are available for violin, 'cello, double bass, guitar, cittern, bouzouki, mandolin, banjo and can be customised to fit most acoustic stringed instruments. Manufactured in the UK and available only through luthiers, repairers and direct from the Pure Acoustic webshop, the Pure Acoustic ATS is backed up by a transferable 5-year limited worldwide warranty. Pure Acoustic Active Transducer Systems are the natural choice for the discerning musician. In addition to the new, unique, natural sounding Pure Acoustic Active Transducer pickup and miniature preamplifier systems for all manner of acoustic stringed instruments, Pure Acoustic Ltd also manufactures and distributes the Skyinbow™ electric violin series and the unique, patented Linnd™ violin shoulder rests.